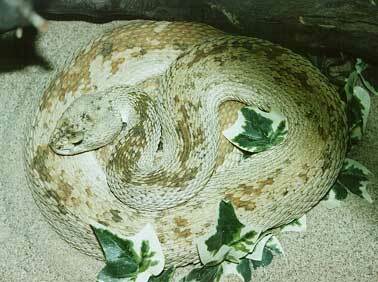 This Prairie Rattlesnake is an extremely rare specimen due to its unusual pattern. This blotchy, uneven pattern is called piebald or calico. This animal, like many of the snakes here at the Rattlesnake Museum, was donated by a private reptile keeper. What a wonderful addition to our exhibit! This snake has amazed Museum visitors at a rate of 50,000 per year...many more than might have visited one individuals home. Thank you, Eric and Kathy Thiss!